 Grew up in Freehold, New Jersey; much of his future work would be indelibly associated with the state. His father was a bus driver and his mother a secretary. He feel in love with the guitar at age 13, and bought his first guitar for $18.  Springsteen worked the clubs of New Jersey and New York for nearly a decade before making it big as a musician. He became the lead guitarist in the band "The Castiles" (and later the lead singer) when he was 16. In the late 1960s, Springsteen performed briefly in a trio known as "Earth," performing mostly in New Jersey clubs. 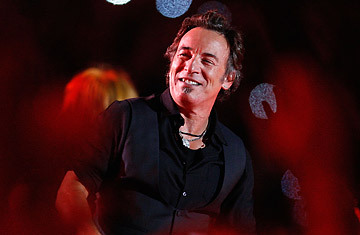 It was reportedly during this period that Springsteen acquired the famed moniker "The Boss," as he would collect the band's pay and then distribute it among his band-members.  Appeared on the cover of TIMEin October 1975 as "Rock's New Sensation." He also made the cover in August 2005 in a story "Reborn in the U.S.A." highlighting how the musician reached out to 9/11 survivors.  Springsteen's subsequent albums earned him greater and greater critical and popular acclaim, culminating in 1984's Born in the U.S.A., one of the best -selling albums of all time. With with over 15 million copies sold in the U.S. alone, the album remains the most successful in Columbia Records' history; 7 of its tracks became Top 10 singles. Released at the height of Ronald Reagan's 1984 reelection campaign, the song "Born in the USA" itself was widely seen as a jingoistic anthem, despite lyrics expressing anger and frustration over the treatment of Vietnam veterans.  "The Boss" was inducted into the Rock and Roll Hall of Fame in November 1999.  He married for the first time in 1985 to actress Julianne Phillips; their marriage ended in 1989, amid rumors that Springsteen was carrying on a relationship with backup singer Patti Scialfa, whom he married in 1991. They have three children together.  On Jan. 11, 2009, Springsteen won a Golden Globe award for his song "The Wrestler," from the movie by the same name, starring Mickey Rourke  an old career wrestler desperately trying to make a living. This wasn't the Boss' first accolade from Hollywood: in 1994 he won an Oscar for his song "Streets of Philadaelphia," which appeared on the soundtrack to the film Philadelphia starring Tom Hanks.  In early 2009, Springsteen made headlines for a dispute with Ticketmaster; the Boss accused the concert promoter of redirecting fans attempting to buy Springsteen tickets online to a subsidiary website, TicketsNow, which sold tickets at highly marked-up prices. Ticketmaster changed its sales policies soon after. "I saw rock and roll's future and its name is Bruce Springsteen."  Critic Jon Landau (who would later become the singer's manager) in Boston's The Real Paper in spring of 1974 after seeing a Springsteen show.  President Barack Obama, joking at an October 2008 fundraiser in New York City, with Springsteen in attendance. "I couldn't believe how happy his music made me and how good it was. He's a gift, and I didn't know. I mean, I knew "Born in the USA" and "Glory Days," but I didn't know that he covered so much ground, and there was something in his music that touched what I was going through, the process of falling back in love with my America." "You always get a sense of personal truth, humility and passion. A sense of humor, a sense of rock 'n' roll and a raconteurism once solely the domain of tribal chiefs. But chief comes from chieftain. And that's just not an American word. Boss? Now that comes from boss man, and if this guy ain't the boss...man, nobody is.  Sean Penn, writing about Springsteen in 2008's TIME 100 issue. "We're in this Orwellian moment where what's true can be made to seem like a lie and what's a lie can be made to seem true, and we've gotten to witness that over the past six years." "I got the chutzpah, or whatever you want to say, to believe that if I write a really good [song] about it, it's going to make a difference. It's going to matter to somebody." "In the past I wanted to make sure that my music was tough enough for the stories I was going to tell." "This music is forever for me. It's the stage thing, that rush moment that you live for. It never lasts, but that's what you live for. "